Forgive the grumpy face, Adelle had just woken up from her nap! I've been in the mood to sew especially since I've spent my nursing nights scrolling through Pinterest to keep myself awake. 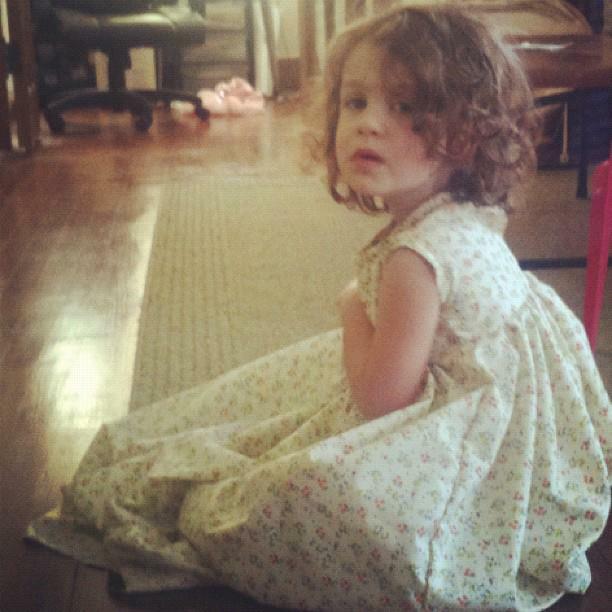 I made this little dress out of fabric I got on clearance for $1.50 a yard at Walmart. Yes although I do despise Walmart I still shop there just like every other American! 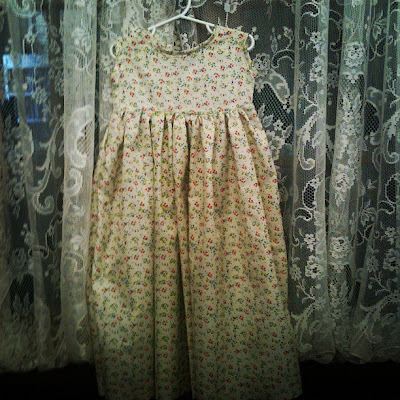 This dress took me probably 2 hours to do, super easy. I didn't take any pictures to do a tutorial but I thought I would share my process with you. If you have a little experience with sewing clothes this project is a breeze. If you don't I'd recommend seeking out a detailed tutorial, my apologies for not being thorough. I used one of Adelle's tank tops (4T) and traced around for the bodice, giving myself a good inch to work with to make sure she could easily put it on. After creating my pattern I cut a front bodice piece & a back bodice piece, making the fronts neckline a little lower. I also created my own bias tape for the neck line & sleeves & used this tutorial for my button closure, believe me this is the best closure ever, you'll never want to do a zipper on a little dress again! This woman is brilliant! First do your button closure on either the front or back, add some detail if you want. I admit I'm a plain jane. Afterwards I sewed my shoulder seams and did my neckline bias tape using this tutorial. I told you she's amazing! Sew the sleeve bias tape on first and then stitch your sides closed. The easiest ways to gather is to lengthen your stitch & tension and do a basting stitch. Hem your dress to the length you want and you're all done! i'm definitely going to be making more of these and an adult version for myself which i will try to get pictures of the process to share. I love maxi dresses for me, I never thought of one for my daughter, beautiful job! Cute! I just tested out that gathering method for the first time last weekend and I was amazed! That will save me SO much time!! !